For a moment, try to generally remember what you were like, where you were, and what you were doing when you were 17 years old. Amy Johnson (not her actual last name) remembers that time of her life well, because that was when she first started having migraine attacks. She didn’t know at the time that those migraine headaches would follow her for another 19 years. When Amy was 36 years old she not only still suffered with migraines, but managing them had become more difficult over time. Amy is one of over 36 million Americans who have suffered with recurring migraines. Her story is like many others migraine sufferers who often try numerous things to cope with the pain but can’t get consistent results. Amy kept searching for solutions. Amy continued to live with pain for years but then reached a tipping point where both her headache and migraine episodes became more frequent and worse. It happened right after she had a child. Nearly two decades after she started having migraine episodes, Amy had more to care for in her life than ever before and yet she was in more pain than she had ever been. With no apparent relief for her migraine headaches in sight, she saw something one day that changed everything. After being evaluated by Dr. Harris and told that she was a candidate for treatment, Amy completed a 12-week neuromuscular rehabilitation and treatment course at MHRPA. The treatment results were nothing less than life-changing. Amy is one of hundreds of migraine sufferers who claim that the neuromuscular rehabilitation techniques that were used on her by Dr. Harris permanently eliminated her chronic migraine condition. In fact, Harris cites a near 95% long-term success rate with migraine sufferers. Harris says that traditional approaches to solving headache and migraine pain often fail because they address only the pain symptoms. Conversely, Harris’s approach involves treating the root causes for pain, and not just the symptomatic response. His treatment protocols are a result of recent advancements in diagnostic technologies and a more sophisticated understanding of the relationship between dentally-related neuromuscular force problems and chronic headache and migraine pain. “We now understand that (migraine pain) has to do with the muscles of the head, neck and jaw, and the way the teeth come together. Forces imbalanced by the way the teeth come together send a biofeedback loop through the trigeminal nerve bundle to the brain. The result is pain. The muscles need to work in harmony for pain-free function, and dentists like myself can now rehabilitate these muscles.” said Harris. Harris states that neuromuscular rehabilitation techniques can address more than just headaches and migraines. They can also be used to mitigate TMJ pain, facial pain, chronic head and neck tension, and even tinnitus. 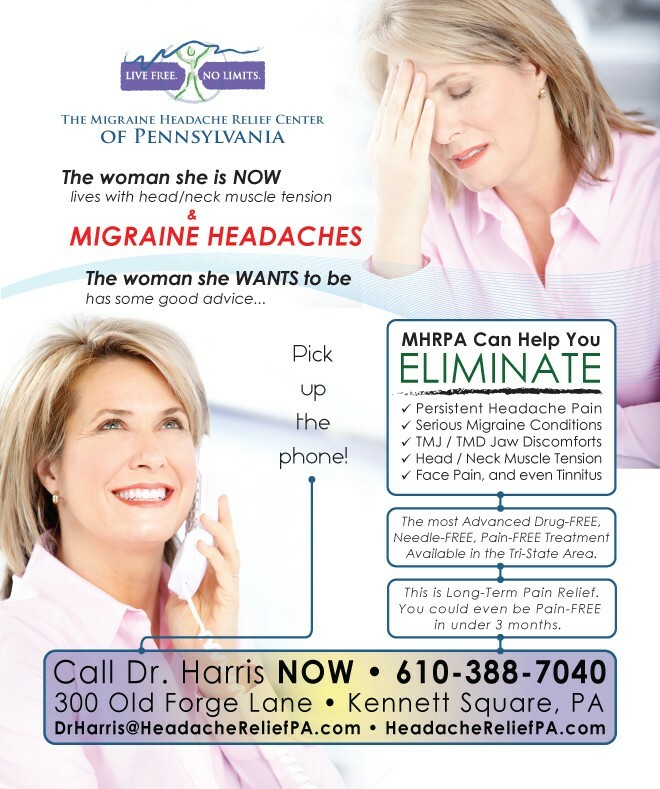 While Harris’s treatments are not yet widely available, MHRPA is within easy reach of most residents of the Tri-State Region. For more information visit www.headachereliefpa.com or call (610) 388-7040. 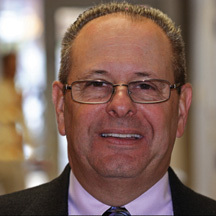 Dr. Harris attended Temple University School of Dentistry and joined the Academy of General Dentistry soon after graduation in 1985. He is highly committed to providing the most advanced treatments available today for general dentistry, chronic headaches and migraines, Temporomandibular Disorder (TMD) and common jaw discomforts, neuromuscular imbalance and chronic tension, Tinnitus (ringing in the ears) and Sleep Apnea. Dr. Harris devotes significant time to his professional development to stay at the cutting-edge of medical dentistry, technologies, and patient care. Professional organizations include the American Dental Association, Dental Society of Chester and Delaware Counties, and Main Line DKU (Dentists Keeping Up.) Dr. Harris regularly attends many continuing education seminars to keep current with the latest advances in headache/migraine treatments. 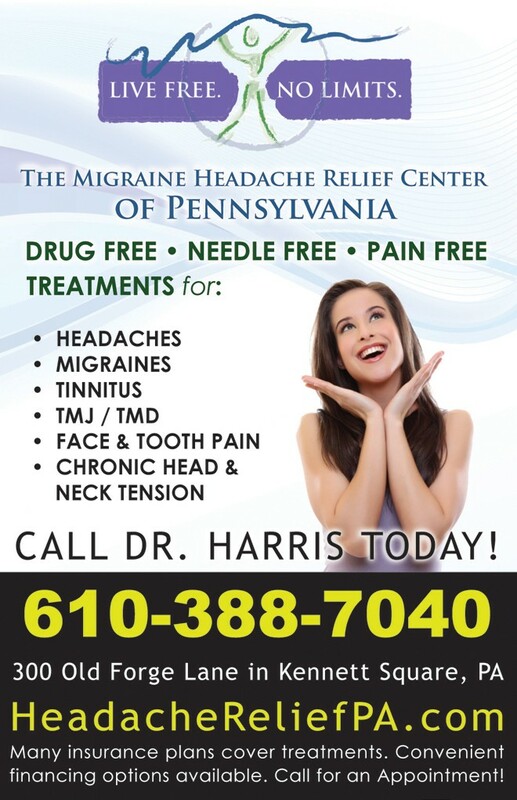 In 2012, Dr. Harris founded the Migraine Headache Relief Center of PA (MHRPA) to bring the most advanced diagnostic and treatment protocols available in the world for resolving headaches, migraines, and TMJ to the people of the Greater Philadelphia Metropolitan Region. Dr. Harris now serves a diverse group of male and female patients throughout the tri-state area (DE, PA, NJ) who could find help nowhere else for their unique and complex pain conditions. MHRPA is currently accepting new patients.